Purpose: Use this document as a reference for Updating Tuition Charges for Student Financials ctcLink. The Term Fees can be copied forward to the next quarter before updating the tuition charge amount. This can make for less data entry. On the Find an Existing Value enter an existing Run Control ID or Click the Add a New Value tab and create a new Run Control ID. To copy the Terms Fees forward. For each Tuition Term Fee, the charge amount needs to be updated. On the Find an Existing Value tab, enter SetID. Click on the Term Fee Code you wish to update. 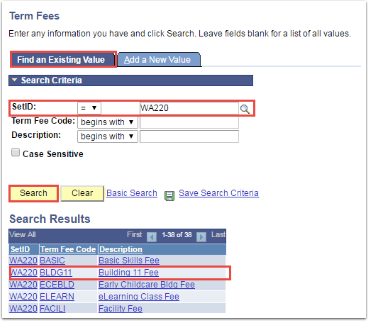 Verify you are on the correct term by clicking the Term Fees tab. 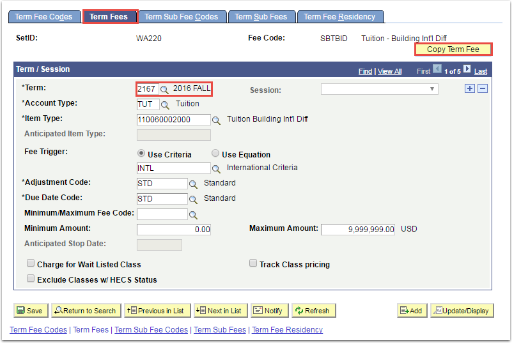 If you do not see the correct term, there is a Copy Term Fee button that quickly copies the information to a new term. Note: Tuition related term fees will have 3 different rows of Sub Fees to represent the 3 different levels of tuition (credits 1-10, 11-18, 18+). Amount/Unit: Enter the amount to charge per unit. Flat Amount: Enter a flat amount to charge, regardless of the units taken. Amount/Unit (surcharge): Enter a per unit surcharge for overload units. Used most often with the tuition term fees. The following steps are for colleges that have concurrent enrollment and/or upper and lower level tuition charges. 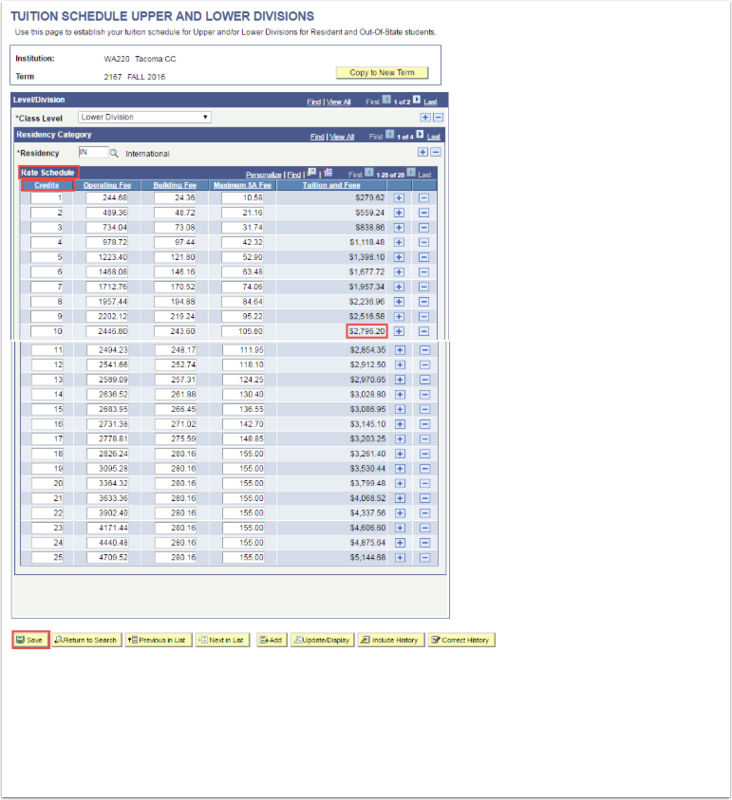 On the Find an Existing Value tab, enter a Business Unit. Click on the specific Term you wish to copy from. Note: If the current term is not listed, select the previous term. 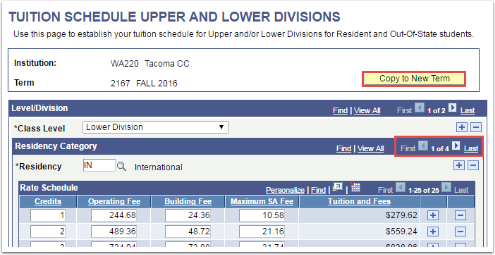 There is a Copy to New Term button at the top right of the tuition schedule to simplify data entry. Enter the From Term of the term you are copying from. Enter the To Term of the term you wish to copy to. Click on OK on the process scheduler request page. Click on Process Monitor to ensure the process runs successully. Click on the specific quarter to update. 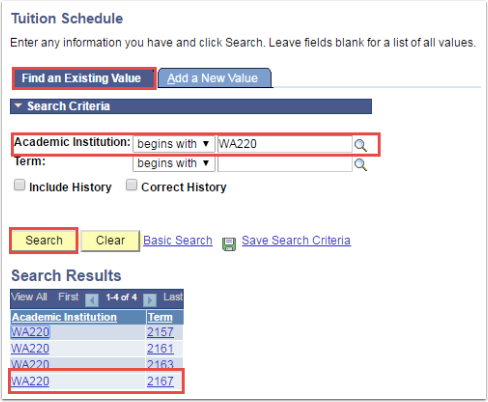 In the Rate Schedule section, click on Credits to sort the list in numeric order. Update each field with the new charges. 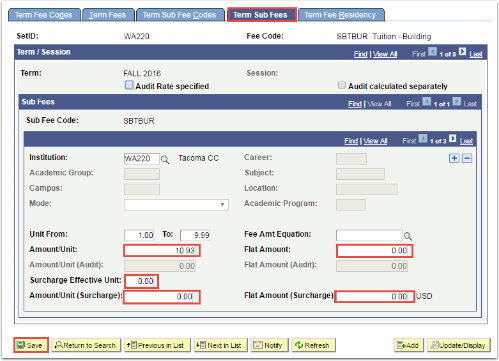 The Tuition and Fees Column is automatically updated for the running total. Update each level/Division for each residency category. Click SAVE on the Tuition Schedule page after completing each Residency Category.